An unaltered photocopy of your DD-214, WD AGO, NAVPERS, NG or other military issued document clearly displaying your Medal for Humane Action authorization. Medal for Humane Action, medal commemorates military service in direct support of the Berlin Airlift. It was awarded to members of the Armed Forces for 120 consecutive days of service in, or in direct support of, the Berlin airlift, 26 June 1948 - 30 Sep 1949. 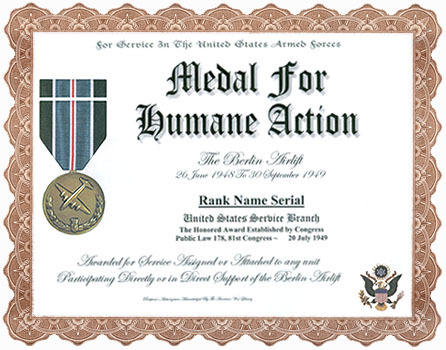 The Medal for Humane Action was established by an Act of Congress (Public Law 178, 81st Congress), 20 July 1949. 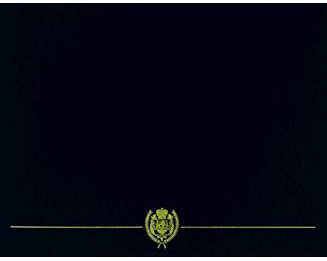 The medal was designed by Mr. Thomas Hudson Jones of The Institute of Heraldry. The C-54 is the type of aircraft used in support of the Berlin airlift, and the coat of arms is that of the City of Berlin. The wreath of wheat represents the staff of life and thereby the necessities of life alluded to on the reverse of the medal. Background This medal is awarded to personnel who were assigned or attached to and present for duty for at least 120 days during the period June 26, 1948 and Sept. 30, 1949, inclusive, with any of the units cited in Department of the Air Force general orders for participating in the Berlin Airlift or for direct support of the Berlin Airlift. Criteria The Medal for Humane Action may be awarded to foreign armed forces members and civilians (U.S. and foreign) for meritorious participation in the Berlin Airlift. In each instance, however, an individual recommendation indicating meritorious participation is required. People whose lives were lost while participating in the Berlin Airlift, or as a direct result of participating in the Berlin Airlift, may be awarded the Medal for Humane Action without regard to the length of the service provided all other requirements are met. The ribbon to the Medal for Humane Action is 1 3/8 inches in width and consists of the following stripes: 9/32 inch black; 1/16 inch white; 9/32 inch teal blue; 3/64 inch white; 1/32 inch scarlet; 3/64 inch white; 9/32 inch teal blue; 1/16 inch white; and 9/32 inch black. The Medal for Humane Action was established by Act of Congress (Public Law 178, 81st Congress) on July 20, 1949. The Medal for Humane Action could also be posthumously awarded to any person who lost his or her life while participating in (or as a direct result of) the Berlin Airlift, without regard to length of service so long as that person was otherwise eligible. The Medal for Humane Action takes precedence after the Army of Occupation Medal (or the Naval Occupation Service Medal) and before the National Defense Service Medal. The Medal for Humane Action was designed by Thomas Hudson Jones (1892-1969). The identity of the first recipient of the Medal for Humane Action was not recorded. In the center of a bronze medallion one and a quarter inches in diameter, a C-54 airplane (as viewed from above) is shown within a wreath of wheat connected at the bottom by a coat of arms. The C-54 is the type of aircraft used in support of the Berlin airlift, and the coat of arms is that of the City of Berlin. The wreath of wheat represents the "staff of life" and thereby the necessities of life alluded to on the reverse of the medal. In the center of a bronze medallion one and a quarter inches in diameter, the eagle, shield and arrows from the seal of the Department of Defense are shown beneath the words FOR HUMANE ACTION and above the inscription in four lines, TO SUPPLY NECESSITIES OF LIFE TO THE PEOPLE OF BERLIN GERMANY. The ribbon to the Medal for Humane Action consists of a central stripe of median blue bisected by a red pinstripe edged in white. The ribbon is edged in black, which is separated from the medium blue by narrow white stripes. Red, white and black are the colors of the Coat of Arms of the City of Berlin; the blue, white and red represent the U.S. colors. The blue also alludes to the skies as the field of action for the Berlin Airlift; the arrangement of the colors inside the black edges also suggests the Distinguished Flying Cross, alluding to the skill and devotion exhibited by the aircrews involved in the difficult airlift operations.